A family living an ocean away from Duquesne found an old photo that helped identify two faces in the wedding party of my grandparents, Anthony Joseph Salopek and Catherine Ann Kučinić. 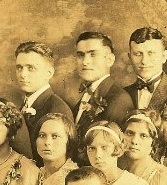 The faces belong to my great-aunt Frances Salopek Bekavac and her husband Mate Bekavac. Can you identify anyone in the Duquesne Croatians Wedding Photos posted on this site? Please contact me if you can! Thanks Marina for your investigative work — and for the photo! < Previous Eureka! — I found it! Next > Rekindling an Old Flame!